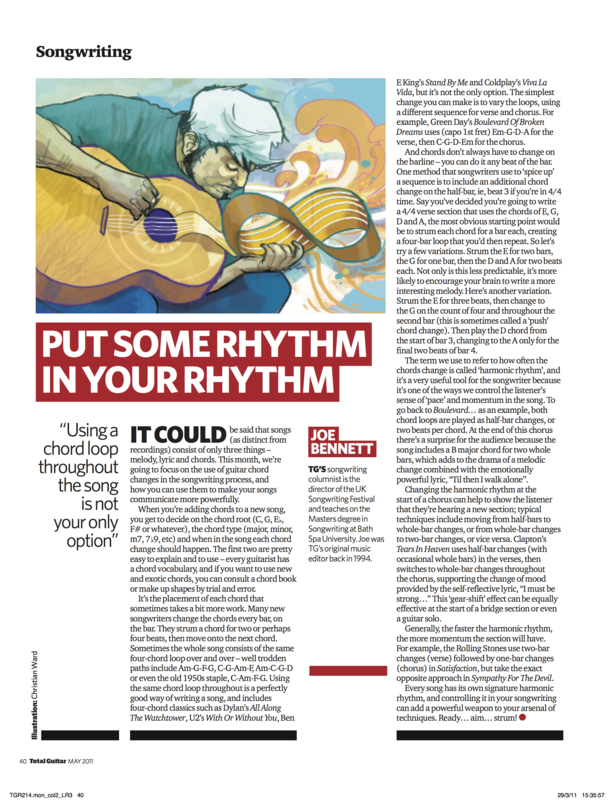 I originally wrote this article for Total Guitar magazine. It appears in issue TG214 (May 2011) and it is reproduced here by permission. It could be said that songs (as distinct from recordings) consist of only three things – melody, lyric and chords. Today we’re going to focus on the use of guitar chord changes in the songwriting process, and how you can use them to make your songs communicate more powerfully. When you’re adding chords to a new song, you get to decide on the chord root (C, G, Eb, F# or whatever), the chord type (major, minor, m7, 7flat9 etc) and when in the song each chord change should happen. The first two are pretty easy to explain and to use – every guitarist has a chord vocabulary, and if you want to use new and exotic chords, you can either consult a chord book or make up shapes by trial-and-error. It’s the placement of each chord that sometimes takes a bit more work. Many new songwriters change the chords every bar, on the bar. They strum a chord for two or perhaps four beats, then move onto the next chord. Sometimes the whole song consists of the same four-chord loop over and over – well-trodden paths include Am-G-F-G, C-G-Am-F, Am-C-G-D or even the old 1950s staple C-Am-F-G. Using the same chord loop throughout is a perfectly good way of writing a song, and includes four-chord classics such as Dylan’s All Along The Watchtower, U2’s With Or Without You, Ben E King’s Stand By Me and Coldplay’s Viva La Vida, but it’s not the only option. The simplest change you can make is to vary the loops, using a different sequence for verse and chorus e.g. Green Day’s Boulevard of Broken Dreams uses (capo 1st fret) Em-G-D-A for the verse, then C-G-D-Em for the chorus. And chords don’t always have to change on the barline – you can do it any beat of the bar. One method that songwriters use to spice up a sequence is to include an additional chord change on the half-bar i.e. beat 3 if you’re in 4/4 time. Say you’ve decided you’re going to write a 4/4 verse section that uses the chords of E, G, D and A. The most obvious starting point would be to strum each chord for a bar each, creating a four-bar loop that you’d then repeat. So let’s try a few variations. Strum the E for two bars, the G for one bar, then the D and A for two beats each. Not only is this less predictable, it’s more likely to encourage your brain to write a more interesting melody. Here’s another variation. Strum the E for three beats, then change to the G on the count of four and throughout the second bar (this is sometimes called a ‘push’ chord change). Then play the D chord from the start of bar 3, changing to the A only for the final two beats of bar 4. The term we use to refer to how often the chords change is called ‘harmonic rhythm’, and it’s a very useful tool for the songwriter because it is one of the ways we control the listener’s sense of ‘pace’ and momentum in the song. To go back to Boulevard… as an example, both chord loops are played as half-bar changes, or two beats per chord. At the end of this chorus there’s a surprise for the audience as the song includes a B major chord for two whole bars – which adds to the drama of a melodic change combined with the emotionally powerful lyric “Til then I walk alone”. Changing the harmonic rhythm at the start of a chorus can help to show the listener that they’re hearing a new section; typical techniques include moving from half-bars to whole-bar changes, or from whole-bar changes to two-bar changes, or vice versa. Clapton’s Tears In Heaven uses half-bar changes (with occasional whole bars) in the verses, then switches to whole-bar changes throughout the chorus, supporting the change of mood provided by the self-reflective lyric “I must be strong…”. This ‘gear-shift’ effect can be equally effective at the start of bridge section or even a guitar solo. Generally, the faster the harmonic rhythm, the more momentum the section will have. For example, the Rolling Stones use 2-bar changes (verse) followed by 1-bar changes (chorus) in Satisfaction, but take the exact opposite approach in Sympathy For The Devil. Every song has its own signature harmonic rhythm, and controlling it in your songwriting can add a powerful weapon to your arsenal of techniques. Ready… aim… strum!